Soufi ou mufti? Quel avenir pour l'islam? Between the "war on terror," the challenge of radical Islam, and the vigorous, assertive presence of a Muslim minority throughout the West, understanding Islam has become a priority for anyone concerned with security, politics, and culture, or most basically, with the future of Western civilization. In this context, the discussion about Muhammad, the Koran, Islam, Islamism, and related issues needs to be as wide-ranging and free as possible. Freedom of speech is truly needed if we are to improve our understanding of these topics. Anyone with information or ideas about needs to feel capable to offer them, with assurances of reasonable distribution. As I put it during one controversy in the United States in 2005, "Especially at a time when establishment institutions are so timid or even deceptive, nothing can be off limits in this debate; and there must be no penalty for those who express their views." In the context of acute political correctness – a problem in France, as throughout the West – I should like to take this opportunity to express my admiration for the work of A.M Delcambre, whose evolving oeuvre provides an ever-more significant element in our understanding of Islam. 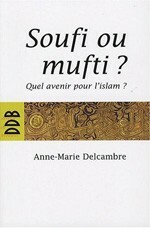 This book, Soufi ou mufti? adds to her corpus by systematically going through some of the main concepts and practices of Islam, clearly explaining their key features. Anne-Marie Delcambre and I broadly agree on the nature of the problem, with one major area of disagreement. She finds no difference between Islam and Islamism, whereas I do. Her vision follows at length in the following pages. Briefly, my understanding holds that Islamism is a specific, extreme, modern version of Islam. Unlike her, I stress change over time. Not only have Muslims not always been as aggressive as today, but looking ahead, an end to the present crisis requires that a moderate form of Islam replace the virulent kind that prevails today. In policy terms, this implies that Western governments should differentiate between Islamism and moderate Islam, crushing the former and encouraging the latter. As you read this book, I urge readers to decide for themselves which way they prefer to interpret the problem. In the end, however, Dr. Delcambre's and my divergence matter less than our agreeing on the need to fight a vicious and dangerous ideology to protect our way of life, and that this constitutes the great battle of our era. She and I stand in the same trench, and I hope that you, dear reader, will join us there.